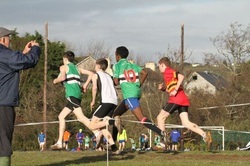 On the 23rd of November last, 3rd to 6th classes sent representatives to the Meath Cross Country Championship races in Bellewstown Racecourse. We all went by bus. It was a wet and windy day and when we arrived all the other schools in Meath were there to represent their locality. Before the race we had our warm up and then we followed the teachers to the start line. St. Andrew’s pupils wore yellow t-shirts. Each school had their own colours. The races were run according to age. I was in the Under 11’s and we did very well especially Jennifer Warren who came 10th out of 250 others, making us very proud. All the other classes did well in the their races also. After the race we all appreciated seeing our parents who had hot drinks and snacks to warm us up. It was a great day out. When the results were calculated we were thrilled to discover that our U11 boys team came 2nd and our U11 girls team were the Champions of Meath in the small schools division!! !